Thanks to all who turned out to sing carols with the residents of The Cottage Residential Care Home and to (or should that be at) the residents of Wellhead Lane. Linda Coxon-Carpenter did a fantastic rendition of The Twelve Days of Christmas with all the actions, many of which I had never seen before - six geese a-laying will live long in the memory! Thanks also to those who listened to us and who generously gave donations to be divided between the church and the Nomad Trust - we raised £55.47. More thanks to the Village Hall Management Committee who welcomed us at the end with mulled wine and mince pies. We'll be doing this again next year in a different part of the village - you have been warned! We look forward to welcoming Lorna as our Rector on Thursday 17 March at 7.30 pm at All Saints' Church, Branston. 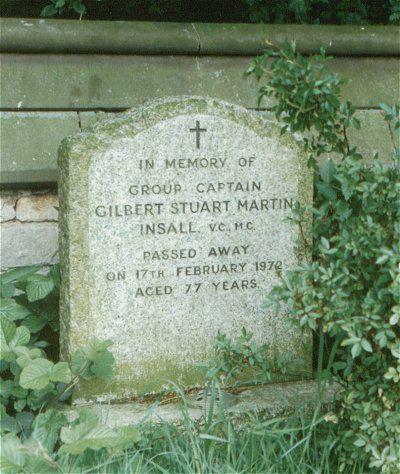 Group Captain Gilbert Stuart Martin Insall VC. MC. On Saturday 7th November 2015 a quarter peal (lasting approx 45 minutes) will be attempted at All Saints Church Nocton to mark the centenary of Group Captain Gilbert Stuart Martin Insall VC. MC. on being awarded the Victoria Cross during the Great War. Group Captain Insall is buried in All Saints Churchyard and survived the Great War dying at the age of 77 on 17th February 1972. “For most conspicuous bravery, skill and determination, on 7 November 1915, in France. He was patrolling in a Vickers Fighting Machine, with First Class Air Mechanic T. H. Donald as gunner, when a German machine was sighted, pursued, and attacked near Achiet. The German pilot led the Vickers machine over a rocket battery, but with great skill Lieutenant Insall dived and got to close range, when Donald fired a drum of cartridges into the German machine, stopping its engine. The German pilot then dived through a cloud, followed by Lieutenant Insall Fire was again opened, and the German machine was brought down heavily in a ploughed field 4 miles south-east of Arras. On seeing the Germans scramble out of their machine and prepare to fire, Lieutenant Insall dived to 500 feet, thus enabling Donald to open heavy fire on them. The Germans then fled, one helping the other, who was apparently wounded. Other Germans then commenced heavy fire, but in spite of this, Lieutenant Insall turned again, and an incendiary bomb was dropped on the German machine, which was last seen wreathed in smoke. 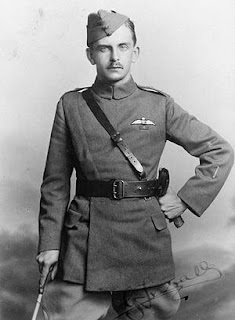 Lieutenant Insall then headed west in order to get back over the German trenches, but as he was at only 2,000 feet altitude he dived across them for greater speed, Donald firing into the trenches as he passed over. The German fire, however, damaged the petrol tank, and, with great coolness, Lieutenant Insall landed under cover of a wood 500 yards inside our lines. The Germans fired some 150 shells at our machine on the ground, but without causing material damage. Much damage had, however, been caused by rifle fire, but during the night it was repaired behind screened lights, and at dawn Lieutenant Insall flew his machine home with First Class Air Mechanic T. H. Donald as a passenger." Group Captain Insall’s Grave in Nocton Churchyard. Harvest Thanksgiving service & supper - thanks! 34 people came together to give thanks to God for His blessings on us all. Thanks to all who decorated the church for the Harvest Thanksgiving service. We also had the benefit of the display made by donations from Nocton Community Primary School to Lincoln Community Larder - much appreciated by us and by the people who will benefit. The collection at the service raised around £50 for the church and another £50 for WaterAid - an international charity that transforms lives by improving access to safe water, hygiene and sanitation. Following the service was the (in)famous Harvest Supper. This was greatly enjoyed by all who attended. Thanks to the fundraising team for all the hard work behind the scenes, all who helped in any way especially to all those who did the catering, Chris for the potatoes and the wine, and to Ted & Ian who unblocked the sinks at the end! A special mention to Rev Les Whitfield for selling off the left over food at the end, including an already open bag of salad!! The Harvest Supper raised £400 for church funds. A massive thank you to all who attended the service and/or the supper - see you again next year! Over the next 4 years the bell ringers at Nocton Church are going to attempt to ring a half muffled quarter peal to commemorate the centenaries of the deaths of the 12 Nocton residents/natives who made the ultimate sacrifice during the Great War. The plan is to ring these quarter peals on the actual anniversary of their deaths if possible. Private Frank Milner was the son of Tom & Minnie Milner of 17 Norris Street Lincoln. He served during the Great War in the D Company, 6th Battalion of the Lincolnshire Regiment. He was sadly killed in action on 9th August 1915 aged 20, making him the second Nocton resident/native to be killed during the Great War. 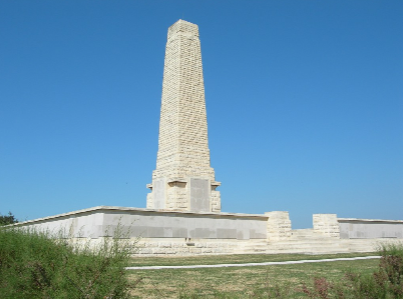 His name appears on the Helles Memorial in Turkey on the Panel 44 to 46. 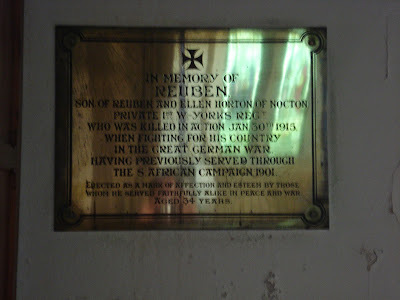 He is also remembered on the War Memorial on the west wall at the back of Nocton Church. 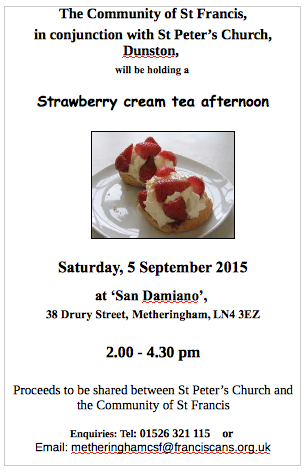 A half muffled quarter peal will be rung on the bells at Nocton Church in his memory on Sunday 9th August 2015. Private William Rawson was the son of William & Susan Rawson of Bucknall. He served during the Great War in the 7th Battalion of the Lincolnshire Regiment. He was sadly killed in action on 24th August 1915 aged 23, making him the third Nocton resident/native to be killed during the Great War. 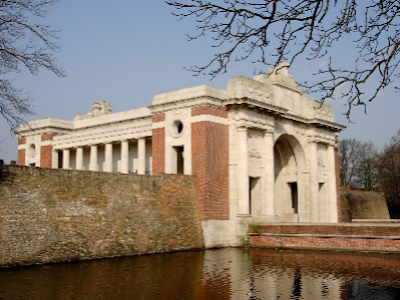 His name appears on the Ypres Menin Gate Memorial in Belgium on the Panel 21. He is also remembered on the War Memorial on the west wall at the back of Nocton Church. A half muffled quarter peal will be rung on the bells at Nocton Church in his memory on Monday 24th August 2015. 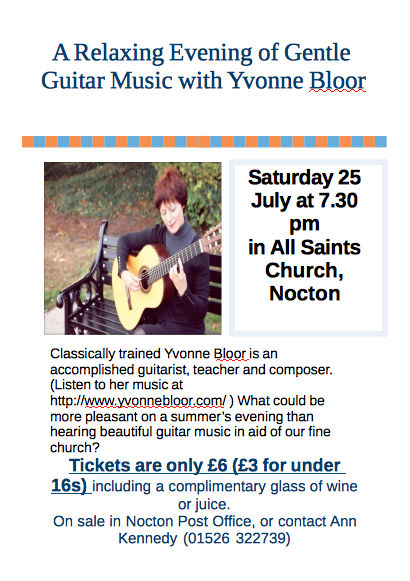 Those of you who weren't able to come to Yvonne Bloor's guitar concert last night missed a real treat. Yvonne played pieces from a number of composers, including some of her own works. She was extremely generous and played for expenses only, as well as donating some of the proceeds of her CDs sold on the night. The amount raised will be posted here as soon as I find out what it is! Thanks to Ann, Carol, Doreen and Jane for all their hard work in organising the concert. Update! We raised just over £400 for the church! Thanks to everyone who supported us. Trinity Sunday falls on 31 May. Being the fifth Sunday of the month, we are having an extra special Group Service which will be at 10.30 (not our usual 9.30). 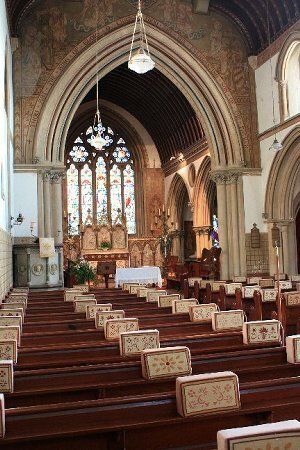 Not only will we be joined by the congregations from Branston and Potterhanworth, we will also be welcoming our neighbouring benefice, Metheringham with Blankney and Dunston. Please join us as we worship together. Replacing our Village Hall – come and hear the results of the recent consultation and find out more about the next steps in this exciting project. There is still time to have your say! Neighbourhood Plan – together with our colleagues in Potterhanworth we are to prepare a Plan which, if adopted, will help shape the future of our village in the way that we, not others, want! This will be a formal document which developers will have to take note of if they want to build in the village. The Parish Council needs the community’s support in preparing this Plan so please come along to find out what’s involved and how you can help. 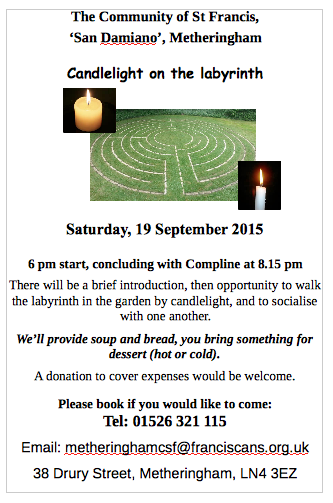 This will be a very informal meeting lasting no more than an hour or so and wine and soft drinks will be available. Sadly we have realised after doing our research that we missed the anniversary of the first Nocton resident/native to be killed during the Great War and so to correct this mistake the bell ringers are planning to ring a half muffled quarter peal on Saturday 30 May 2015. The ringing will last around 45 minutes and will have the mournful sound of being rung half muffled, which gives a loud stroke followed by a quiet stroke (effectively an echo). Private Reuben Horton was the son of Ellen Horton of Ten Row Nocton and was married to Florence Ada Horton. He served during the Great War in the 1st Battalion of the West Yorkshire Regiment (Prince of Wales’s Own). He was sadly killed in action on 30 January 1915 aged 35, making him the first Nocton resident/native to be killed during the Great War. His name appears on the Ploegsteert Memorial in Belgium on the panel 3 to 4. He is also remembered on the War Memorial on the west wall at the back of Nocton Church and on a plaque in his memory at the east end of the south aisle in the Church. 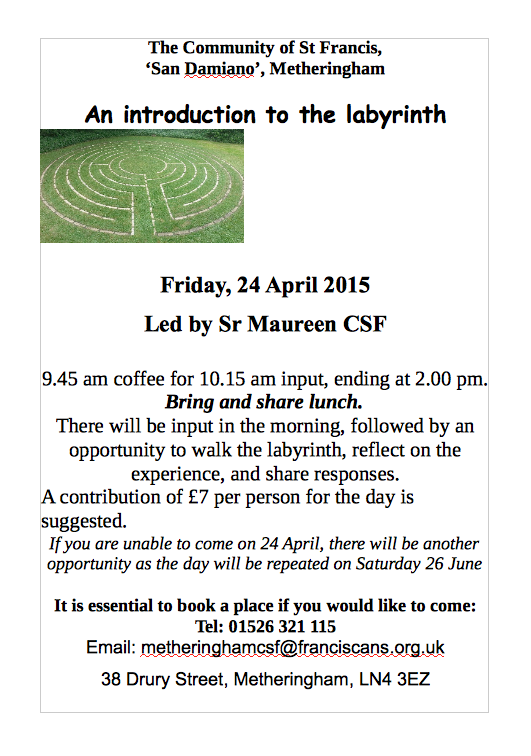 A half muffled quarter peal will be rung on the bells at Nocton Church in his memory on Saturday 30 May 2015. 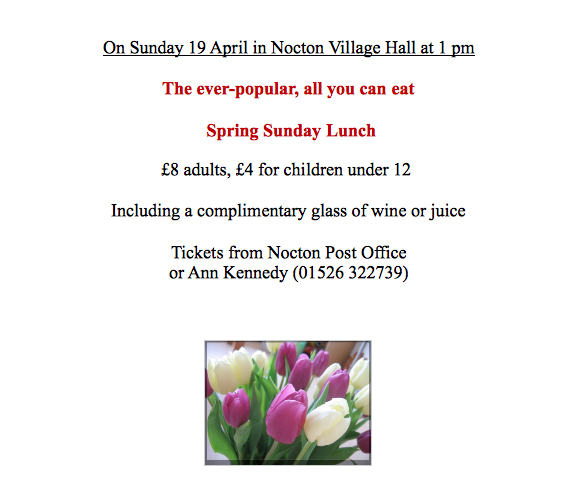 Around 30 people came to the fantastic Spring Sunday Lunch on 19 April. Advertised as 'all you can eat', it certainly lived up to its billing and no one went home hungry! A range of delicious quiches, salads and desserts made for a winning combination with plenty on offer for vegetarians and meat-eaters alike. The company was fantastic too and there was a real buzz of people enjoying themselves. Best of all, the event raised over £200 for our lovely village church. Many thanks to the three stalwarts who did all the work behind the scenes organising the event (you know who you are!! ), all those who contributed food, raffle prizes etc, and everyone who bought a ticket! This was the second year of this event - let's hope it's not the last! 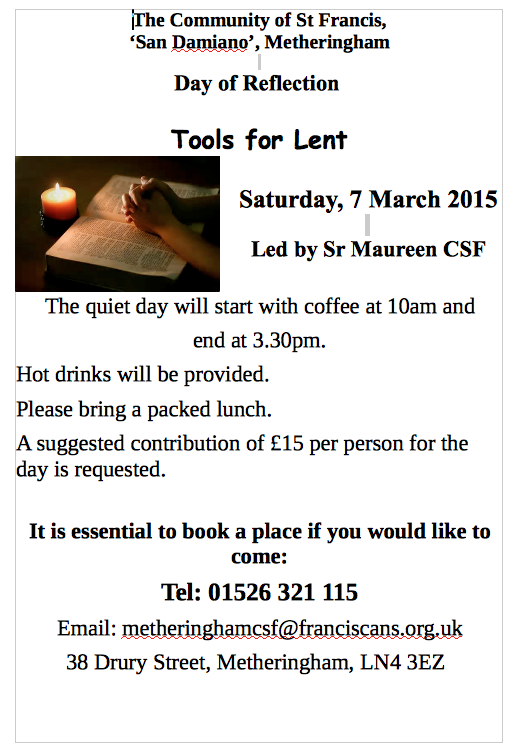 These were held on Tuesday 14 April. Six members of the congregation attended along with Rev Les Whitfield. Liz Murray was elected unopposed as the (sole) churchwarden. Carol Bennett, Nicholas Bennett, Ruth Eagle, Doreen Green, Chris Howard and Ann Kennedy were elected unopposed to the Parochial Church Council. 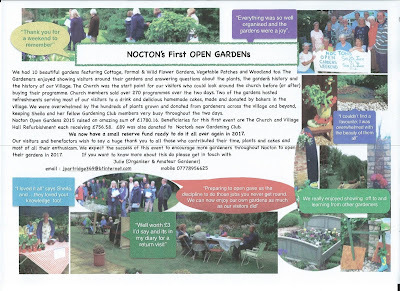 We look forward to serving the community of Nocton in the coming year. This is the day Jesus Christ, God's beloved son, rose from the dead and brought the gift of forgiveness and eternal life to all who would like to receive it. Have you ever wanted to visit our lovely church but not found it open? The church will be open on Friday afternoons between 2 and 4 pm until the end of October. Please drop in and see us! There will be a celebration of Easter on Easter Day at All Saints at 11 am (not 9.30). There is also Commemoration of the Last Supper tonight (Maundy Thursday) at 7.30 pm. Thanks to Carol Bennett for this report. There was lots of toe tapping, singing, clapping and dancing when Gone to the Dogs played Irish music, only 11 days after St Patrick's Day! There were green shamrocks hanging from the ceiling, and over 60 people (many of them wearing green) got into the spirit (or perhaps it was Guinness, served by the Social Club). The violin, guitar, penny whistle and voice combo were known to Nocton residents from their appearance last year on the village green for the annual picnic, and it was great to hear them again. The Irish stew, soda bread and apple pie supper went down a treat and a good time was had by all. 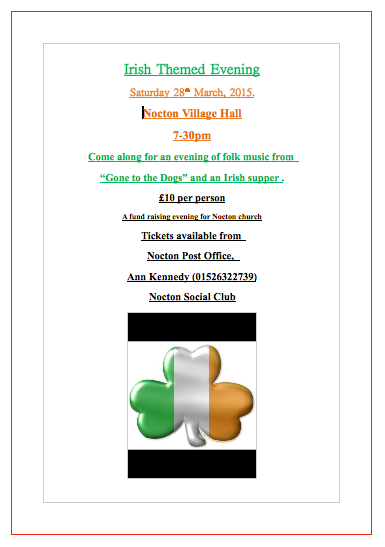 Thanks to all who helped to raise over £450 for Nocton Church. The Annual Parish Meeting (APM) and the Annual Parochial Church Meeting (APCM) - the church's AGM - will be held on Tuesday 14 April at 7.30 pm in church. Please join us on 14 April! We promise not to elect you as PCC member or sidesperson unless you actually volunteer! 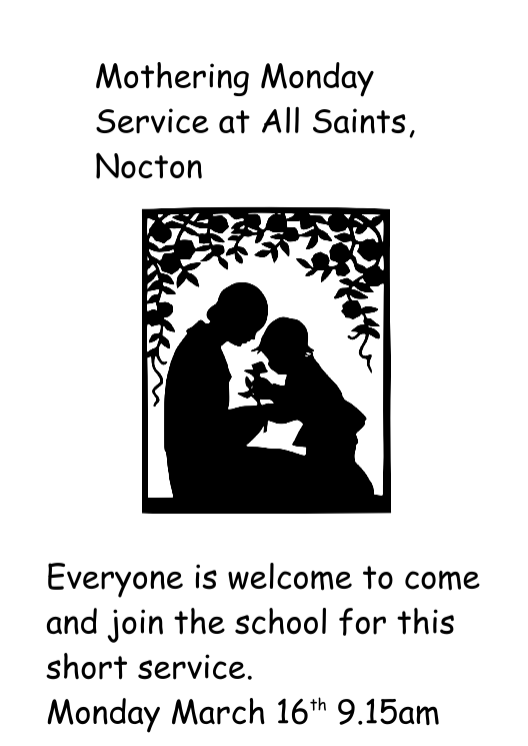 On Monday March 16th Nocton School held its first Mothering Monday service in church. As well as all the school children, it was well attended by parents and pre-school children. 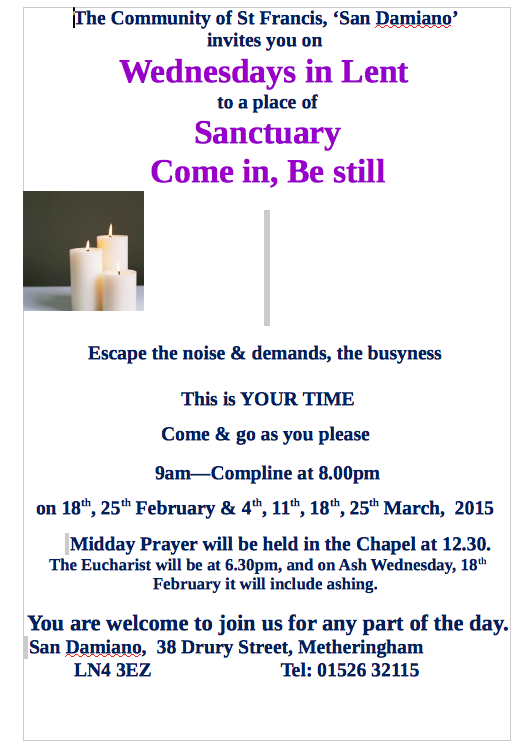 The school and church welcomes all members of the village to these services, so please do feel free to join us. The Revd. Jonnie Parkin led the short service and he asked us to think about all that mothers do for us. We also watched a series of pictures on the white screen which complemented the beautiful words and music of John Rutter's hymn " For The Beauty Of The Earth". The service concluded with the children coming to collect a posy and a poem for their mothers. Sorry this is a bit late but I thought you would like to hear about it anyway. Thanks to Jane Kania for this! 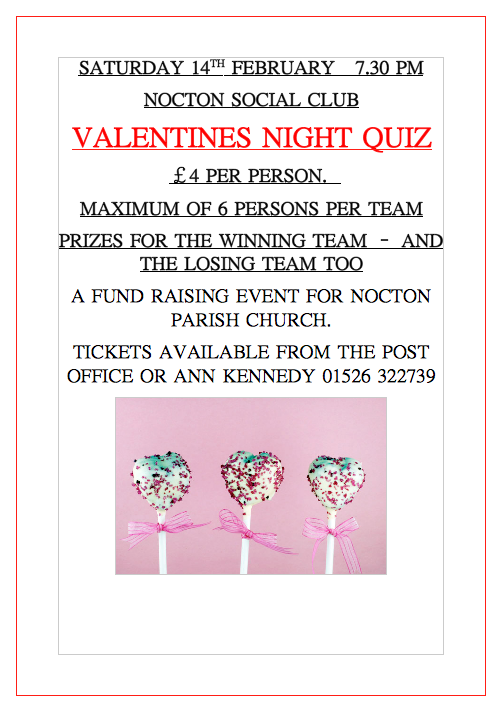 Eight teams took part in a Valentine's night quiz at the social club as a fund raising event for the church. It was a close run competition with each team trying to use their "Cupid" to maximise their points. In the end only half a point separated the top two teams. A great night was had by all, the winning team shared a basket of valentines themed goodies, the gallant losers received chocolate heart shaped lollies and over £200 was raised for the church appeal. 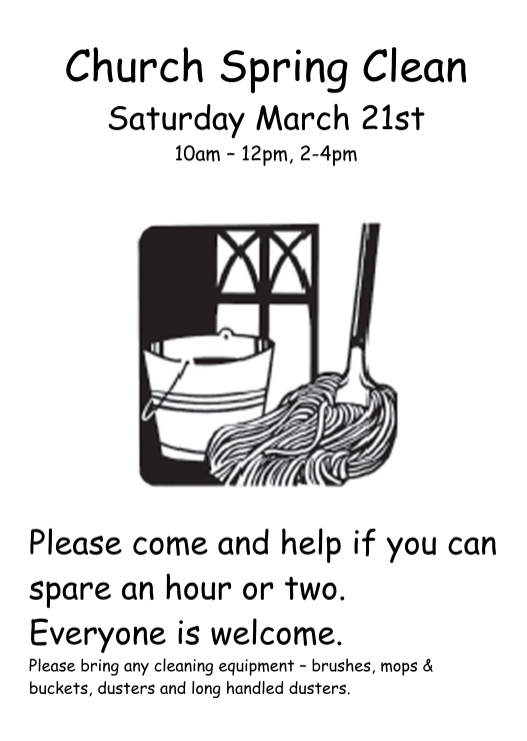 Thank you so much for coming along on Saturday & giving our lovely church a thorough clean. It's good to spend some time once a year doing all those extra bits, which keeps our usual monthly clean to a manageable level. Thanks also for the work on the door. Two more events for you! Wednesday 18 February is Ash Wednesday, the start of Lent, when we begin the time of preparation for Easter. 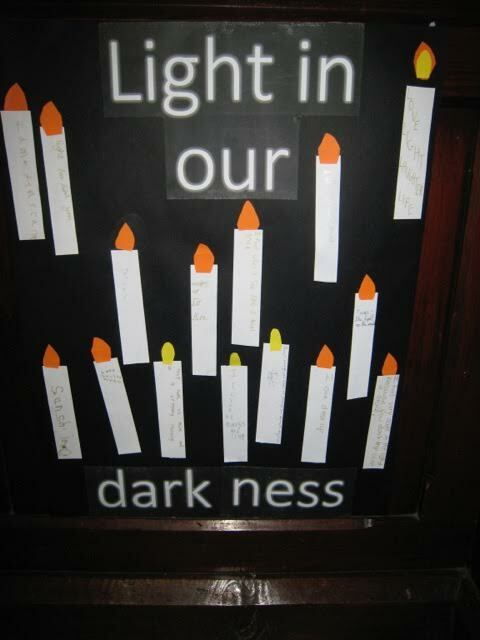 On Ash Wednesday we will celebrate Holy Communion at 7.30 pm, with the ancient ceremony of 'ashing'. Each worshipper is marked on the forehead with a cross drawn in ash, which is made from the palm crosses blessed at the previous year's Palm Sunday service. The 'ashing' is accompanied by the words 'Remember that you are dust, and to dust you shall return.' The intention is to remind the worshipper to repent of their sins before it is too late. What better way to spend St Valentine's Day than arguing with your nearest and dearest over the right answer? !